Being winter and being cold(ish) we decided I should invest in a pair of Ugg boots. 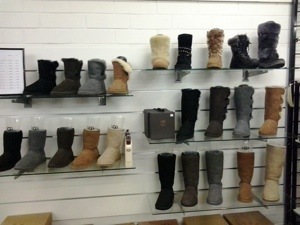 So we went to Coastal Uggs on Jetty Road in Glenelg. “Great, they have a sale on!” I said. Inside walls of sheepskin boots, slippers and all manner of novelty footware awaited. “Hello,” I said to the Ugg man, “I’d like to buy some Ugg boots, please.” He looked happy. There were no other customers. “Ah, I get it. It’s like calling a vaccuum cleaner a Hoover!” (Aussies hate this, but they don’t mind calling cling film Gladwrap). “No,” I said, “I want Uggs.” So I got my Uggs. They are super comfy and warm, like wrapping my feet in a sheepskin rug. Perfect for wearing inside in the slightly cold(ish) South Australian winter evenings.